A great way to see the best of Glasgow - on an open-top bus touring round the city's finest visitor attractions. Children under 5 are carried free of charge! Runs several times a day, every day! 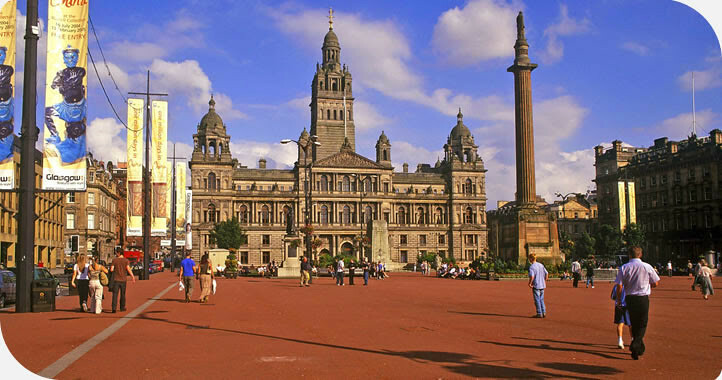 The history of Glasgow, Scotland’s largest city is rich and diverse. In its 1400 years Glasgow has been a religious community, a salmon fishing village, a medieval university town, a major centre of trade with North America and the second city of the British Empire, famed for its shipbuilding and engineering. 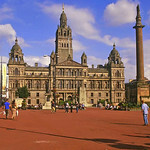 Today Glasgow is renowned as one of Europe’s foremost visitor destinations. Its outstanding variety of museums, galleries and performance venues led to the city being one of the first to be designated European City of Culture. Victorian Glasgow has left a magnificent legacy of civic buildings that are just waiting to be discovered. Visit the recently refurbished Kelvingrove Art Gallery and Museum where the highlights include impressionist paintings and wonderful medieval armour. Close by take a walk in leafy Kelvingrove Park or visit the campus of Glasgow University to enjoy the panoramic views from the tower. Back in the city centre the Gallery of Modern Art has four floors of exhibition space that attracts visitors and locals alike and to the east the People’s Palace, on Glasgow Green, tells the story of the city from the perspective of ordinary working folk. The bustling Merchant City was once home to warehouses and markets. Now it’s a sophisticated area of bars, restaurants and housing. This historic area is home to towering Glasgow Cathedral, which dates from Norman times, the Necropolis where many of the city’s wealthy merchants are buried and the Provands Lordship, the oldest building in Glasgow. Glasgow is a city with its own style. A style that is reflected in its modern retail centres (known as "The Style Mile”) which attract shoppers from all over Europe. Our open-top bus tour of Glasgow is the ideal way to discover all that is best about Scotland’s largest and most colourful city. There are up to 3 departures every hour and you can hop on and off at stops along the route so that you can explore the places of interest that you are hearing about in the commentary. Your ticket is valid for 48 hours. The commentary is provided in English, French, German, Italian, Spanish and Swedish. Children under 5 years are carried free of charge. Click on the 'Book Now' button to make your reservation. Enter your dates and requirements and complete the booking. Scottish Tours will confirm availability to you immediately or very soon thereafter. Rest assured no payment will be taken if they cannot confirm the booking to you. Scotland's largest city and the centre for visual arts culture with a strong sense of belonging.